I will warn you up front, this is hard to stop eating. The flavors dance on your tongue and cause you to keep picking up chip after chip and dipping and eating. I couldn’t stop myself. 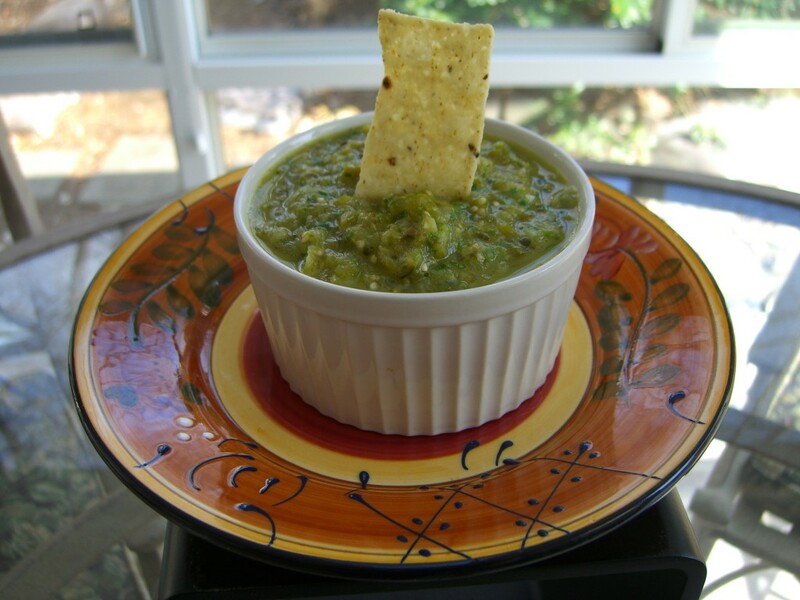 This is a great salsa but an amazing creamy salsa too. I will find many ways to use these besides dips. Maybe sauces to chicken, pork or fish just to name a few. This morning it was great on top of my omelet with pinto beans. How many ways can you find? Pre-heat oven to 400 degrees. Clean and prep the vegetables- peppers, onion, garlic, tomatillos. Toss in oil and spread out on the baking sheet. Bake for 30-40 minutes until browned. Remove and let cool for 15 minutes. Put all the roasted foods into food processor with cilantro, seasonings and a little oil (1 tsp) and puree. Add in cumin, salt and pepper. Taste and adjust seasonings if needed. 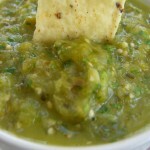 Start with the Tomatillo Salsa recipe and add 1-3 avocados into the processor. I used half of salsa recipe with 1 large avocado. Note to self–Don't forget to plant tomatillos again this year. This looks soo good to me right now. Note to self–Don’t forget to plant tomatillos again this year. This looks soo good to me right now.